The primary focus of the Board of Evangelism is bringing the Gospel of our Lord Jesus Christ to the congregation and our community. The Board of Evangelism is currently meeting on a monthly basis to explore new ideas and activities in which to share the faith we all have in our risen Lord and Savior, Jesus Christ. Updates on the progress of those board activates will be share as they develop. This Board also makes visitations to shut-ins, the ill and the recuperating. They also provide 'packets' to visitors at our services that introduce them to St. John. They will also inform the membership of developing Evangelism programs through articles in the monthly newsletter and here on our church website. April 4, 2019 - The Evangelism Committee will meet again on Tuesday, May 7th at 7:00 p.m. Members of St. John are equally invited to join our topical discussions based upon the Concordia Mission Society “Good News” periodical. Our regular meeting will follow. March 6, 2019 - "Everyone His Witness" helps to equip the disciples of Jesus Christ in witnessing to others in everyday lives among the relationships we have with others. The six, one-hour sessions of E1HW will be presented in a one-day, Saturday workshop facilitated by Pastor Toensing here at St. John has been postponed in search of a more convenient date for everyone. Please stay alert for future announcements. In the meantime, a "general-interest" sign-up sheet remains in the narthex to help field interest of those who would like to participate at a later, chosen date. Future announcements will follow. 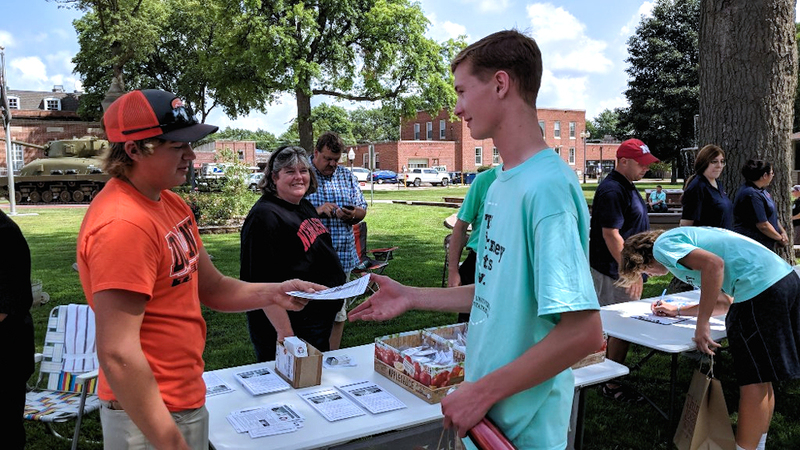 St. John Participates in the Doane University "Downtown Tour"
August 18, 2018 - The Evangelism Committee made representation of St. John today at the Doane University "Downtown Tour" event held each year for incoming freshman. 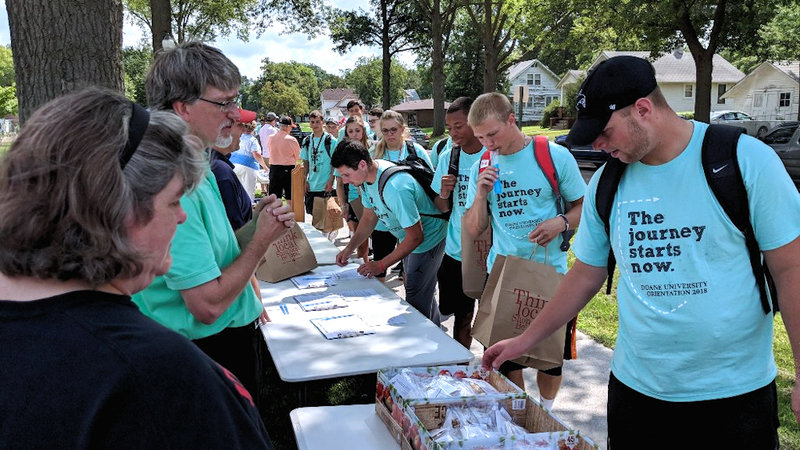 Our church was able to set up a table in the City Park as students walked by visiting with various other groups also having a table or booth. The event is designed to acclimate newly arriving students to Crete as they begin their college life away from home. Inviting these youngsters to our church is all about community, and is about as neighborly as one can be when meeting for the first time! October 3, 2018 - The October Evangelism Committee meeting is scheduled to begin at 7:00 p.m. on Tuesday, November 6, 2018. Members of St. John are also invited to be a part of a new topic of discussion based upon a Concordia Mission Society “Good News” periodical entitled, “Baptize & Teach: Curriculum #1” from this an earlier Publication. More information will be shared at the meeting. Please join us if you can. The Evangelism Committee has also begun the introduction of the “Every One His Witness” workshop. This multi-week, lessoned group environment began on Wednesday, September 26th and is designed to equip disciples of Jesus Christ in sharing the Gospel within their everyday lives. Lesson context modules are built on the core module of applying the LASSIE approach (Listen, Ask, Seek, Share, Invite and Encourage) to specific witnessing contexts. The previous Voters meeting allowed members to designate themselves as being interested in participating in this workshop.